The Southern Alps enjoy the Mediterranean climate of the South. Naturno / Naturns is one of the driest regions of the entire Alps thanks to its location at the foot of the Texel Group Nature Park. With a sensational 315 sunny days a year, the mild climate is perfect for both outdoor fans and activity enthusiasts. Your accommodation at the Preidlhof is blissfully situated between alpine meadows and palm trees. The climate in South Tyrol is exceptionally mild and seduces you into the southern Dolce Vita lifestyle in spite of its proximity to the mountains. Not only grapes grow here, palms and citrus trees are also aplenty. Rare alpine plants thrive on lush alpine meadows a little further up. The eternal ice is also in abundance in South Tyrol, impressive glacier landscapes hide precious pearls of nature. The Texel Group Nature Park is the largest nature park in South Tyrol with an area spanning 33,430 hectares and also the most diverse. A paradise for nature lovers, leisurely connoisseurs and adventure-hungry mountaineers. The expanse stretches out to 1,200 metres to rustic alpine farm estates between chestnuts and cypresses. 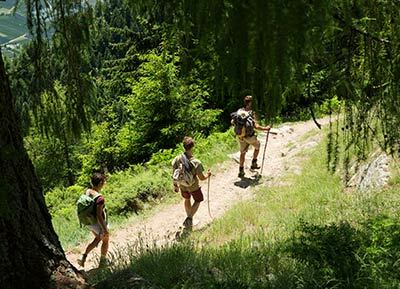 As you head higher approaching 1,500 to 2,000 metres, you will encounter lush larch woods and extensive alpine pastures until finally reaching the high alpine lake district. The Spronser Lakes can also be found here – in the heart of the Texel Group, which impresses as the most beautiful nature park in South Tyrol with its abundance and variety. The Texel Group is a jewel for hikers and nature lovers. The paths and steep trails in the nature park are properly and attentively marked and sign-posted, so that you can hike through the entire area without encountering any major orientation difficulties. Each hike imparts the visitor with fascinating images of the natural landscape, a variety of fauna and flora, an abundance of diverse views of the glacier mountains of the Ötz Valley and Ortler Group and, of course, the Dolomites both up close and afar. In a nutshell: the hiking world of the Texel Group offers the entire range of symbiosis you would expect in South Tyrol - from the sub-Mediterranean vegetation zone as far up to the eternal ice. The variety of climate zones corresponds to the diversity of habitats. The alpine plateaus with the many lakes offer ideal biotopes for many species of birds. The Texel Group is home to one of the largest wildlife populations in South Tyrol. Chamois, ibexes and marmots can be observed alongside roe deer and red deer. Many Mediterranean animal species live further to the South, such as green lizards, dormice and mantises. Fish scrimmage around in the streams while golden eagles do their turns above in weightless elegance. The plant world is equally diverse. Vines, fruit and chestnut trees thrive in the fertile valley basin. The southern slopes are covered with mixed forests and splatterings of pine trees, while extensive larch forests stretch across the steep, rocky slopes. 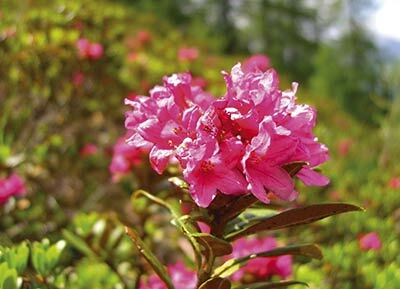 Spruce forests dominate the area above 800 m. A belt of dwarf shrubs with scattered alpine roses, blueberries and striped daphne can be found between the forest boundary and the alpine grass heaths. Edelweiss, phyteuma hemisphaericum and gentian can be found above the tree line alongside alpine grass. The nature park belongs entirely to the Central Alps from a geological perspective. One of the rock types found here is the Ötz Valley crystalline, which forms the main crest, and the Stubai crystalline in the surrounding area of the Timmelsjoch. The main rock types include gneiss with different proportions of biotite, quartz and garnet mica schists. The gneisses and mica schists are occasionally embedded with marble. Around 70 different minerals have been documented in this area, such as rock crystal, apatite, calcite or fluorspar. The Granatenkogel deserves a special mention here, since it is known throughout collectors’ circles because of the beautiful, large garnets found there. The Texel Group region is very rich in water thanks to the significant storage capacity of the widespread loose rocks and the vast ablation of the glaciers. The Spronser Lakes form the heart of the area and showcase a unique image of scenic natural beauty combined with the surrounding three thousand metre peaks and the alpine meadows below. 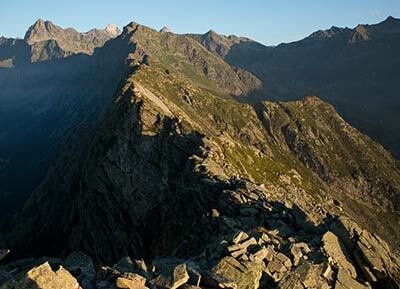 The wonderful nature of the Merano region is a paradise for athletes and activity enthusiasts. Whether you are an ambitious mountaineer, casual hiker or mountain bike fan – the mountain scenery surrounding the Preidlhof leaves no wish unfulfilled.